Dr. Eric Benefield & Jonathan Benefield | Grand Dental P.C. When you need the help of respected dentists in Grand Junction, CO, look no further than Dr. Eric and Jonathan Benefield! 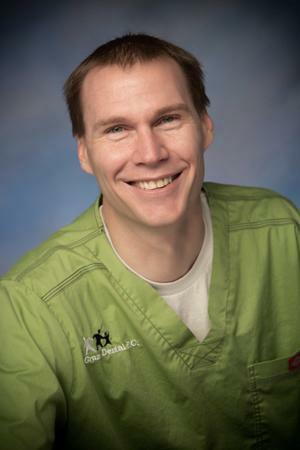 As the dentist at Grand Dental, P.C., Dr. Eric is happy to provide you with the top class dental care you deserve. Get to know more about the men who would love nothing more than to make you smile each day! I was born and raised right here in Grand Junction, Colorado, and I’m proud to be a native of the Grand Valley. Growing up on the Redlands, I have some fond memories from Scenic Elementary, Orchard Mesa Middle School, and Fruita Monument High School. Outdoor recreation is still right up my alley. Some of my favorite things to do include hiking, biking, hunting, fishing, playing golf, and watching movies. I don’t know why golf is listed because my inconsistency drives me crazy, but I continue to enjoy trying to improve! I completed my undergraduate studies at Utah Valley University. Then, I was very blessed to be selected as one of the 140 dental students from a crowd of nearly 3,000 applicants at the University of the Pacific School in Dentistry in San Francisco, CA. In 2003, I graduated #1 in my class as valedictorian. Upon graduation, I served as a dentist in the U.S. Army for 3 years at Fort Polk, Louisiana. My life revolves around my beautiful wife, Aimee and our six kids! Our four daughters, each born in different states, are growing up to be beautiful young women just like their mom! With only one son, we wanted to make his name meaningful. So, Hinckley is named after one of the most influential men in both my life and my wife’s, Gordon B. Hinckley. Then, just as I thought we were done growing our family, we were blessed with one final addition. Thomas is named after another hero of ours, Thomas S. Monson. Coming home to Grand Junction, CO in October 2011 was one of the big highlights in my life. It is so fun to be raising my children right here where I was raised. Their love for the outdoors and the western slope continues to grow! It’s great to be home, providing dental care in this area of the world that means so much to me! Your comfort is our number one priority. Schedule an appointment with our dentists to learn what kind of wisdom teeth you have and whether or not you will need wisdom teeth removal. Visit Grand Dental today or call 970-243-8580 to learn more. You can also use our online form to make an appointment.